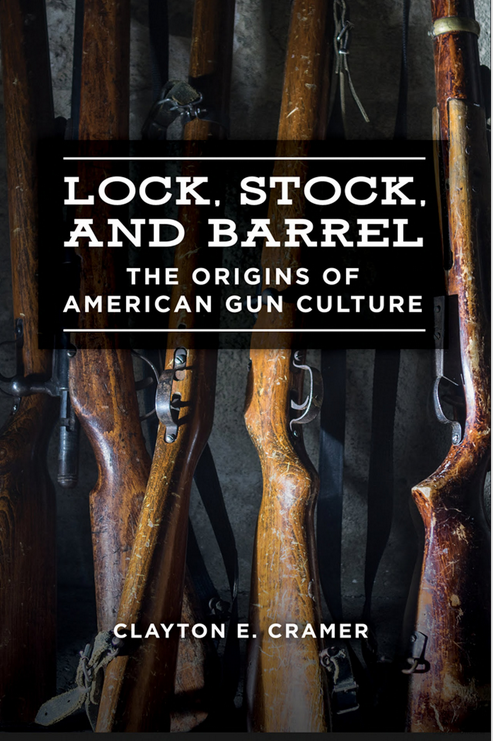 I had the opportunity recently to review historian Clayton Cramer’s new book, Lock, stock, and barrel: The origins of American gun culture (Praeger, 2018), for CHOICE, a monthly publication of the Association of College & Research Libraries designed to help librarians decide which books to add to their collections. My overall evaluation is that this is an important reference volume for libraries, and one which some gun people will want to have in their home libraries. In this book, Cramer challenges recent work by historians like Pamela Haag (The Gunning of America, 2016) who argue that guns and gun culture were not a major part of American society until after the Civil War. To prove them wrong, he compiles snippets of original source material on laws mandating gun ownership and regulating hunting, as well as on the number of gunsmiths and gun manufacturers, in the colonial period. Here we find all manner of interesting facts, like a 1619 statute in the Virginia colony that not only required church attendance, but also that “all suche as beare armes shall bring their pieces, swords, pouder and shotte” with them, under penalty of a 3 shilling fine (p. 2). Clearly, the armed church security that I have just begun examining is not new. In the Plymouth Colony, we find a report of a member of an expedition led by Miles Standish in 1621 who “shot at an eagle and killed her, which was excellent meat; it was hardly to be discerned from mutton.” Another account from 1627 by Issack de Rasieres from New Netherlands tells of a “Sabbath-day procession up the hill to worship, every man armed and marching three abreast.” Rasieres later explains how colonists dealt with birds who ate their corn: “Sometimes we take them by surprise and fire amongst them with hail-shot, immediately we have made them rise, so that sixty, seventy, and eighty fall all at once” (pp. 18-19). Such routine engagements with firearms was not limited to Plymouth. In Colonial Maryland, “Hunting, sometimes for sport but mainly for pot, occupied many hours.” Marylander George Alsop described how he and his fellow indentured servants passed the time in the winter. There was little to be done “unless their Ingenuity will prompt them to hunt the Deer, or Bear, or recreate themselves in Fowling, to slaughter the Swans, Geese, and Turkeys. . . . For every Servant has a Gun, Powder and Shot allowed him, to sport him withal on the Halidayes and leasureable times, if he be capable of using it, or be willing to learn” (p. 21). On the Maryland frontier in the mid-18th century, “A well-grown boy at the age of twelve or thirteen years was furnished with a small rifle and shot-pouch. . . . Hunting squirrels, turkeys, and raccoons soon made him expert in the use of his gun. . . . Shooting at a mark was a common diversion among the men when their stock of ammunition would allow it” (p. 22). And on and on and on. Cramer continues his documentary tour in the early republic (1783-1846) where he finds extensive written evidence of plentiful guns and robust gun culture in travelogues, advertising, and newspaper reports. If this sounds familiar, that’s because it is. 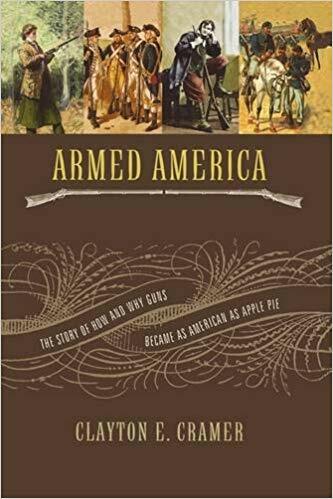 In Armed America: The remarkable story of how and why guns became as American as apple pie (Nelson Current, 2006), Cramer famously challenged the work of another historian, Michael Bellesiles. In his book Arming America: The Origins of a National Gun Culture, Bellesiles argued that private gun ownership was rare in Colonial America and the early republic, that colonists did not like and rarely used guns, and that American gun culture only really emerged during the Civil War when firearms became more affordable. The research upon which these claims were based, however, was subsequently shown to be falsified and Bellesiles had the Bancroft Prize awarded for the book revoked and was forced to resign from his tenured position at Emory University. As Cramer argued in response to Bellesiles, guns played a fundamental role “for the collective military purposes of each colony; for the defense of individual families and isolated settlements; as symbols of being a citizens with the duty to defend the society; and more than occasionally, to demonstrate that nothing has changed in the human condition since Cain slew Abel.” Thus, Cramer concluded, “Gun ownership appears to have been the norm for freemen, and not terribly unusual for free women and at least male children, through the Colonial, Revolutionary, and early Republic periods” (Armed America, p. 236). The point of his new book is essentially the same, and in fact a number of passages from Armed America appear verbatim in Lock, Stock, and Barrel. Cramer, I am sure, would argue that these points bear repeating as critics of American gun culture themselves recycle old arguments. Lock, Stock, and Barrel thins out as Cramer moves to with postbellum period (1865-1930) and concludes with modern gun cultures (1930-present), but the work on early American history makes this an important reference book on guns in American society for those who don’t already have Armed America, or those who just love books. A final note: As Lock, Stock, and Barrel is organized around answering specific questions rather than telling a story about guns, it does lack a coherent historical narrative and thus can be dry at times. Which is why I think of this as being an excellent reference work, meticulously researched and documented. Tags: Clayton Cramer, Gun Ownership, History, Michael Bellesilles. Bookmark the permalink.